If you haven’t tried this already, where have you been!! 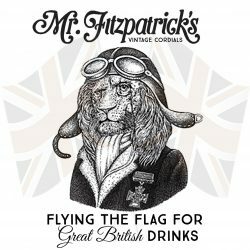 Mr Fitzpatrick’s are as passionate as ever about their cordials and whilst many of their recipes owe their origins to the original Fitzpatrick’s herbalists, they have stayed true to those traditions whilst expanding and developing their range of exciting and quirky cordials. All their vintage cordials are still produced today using only the finest natural ingredients. Cordials from Mr Fitzpatrick’s are the perfect way to start summer for all things cocktails and mocktails and we just LOVE THEM!…Which is probably why we have them in most of our bars and pubs.